Tire Pressure Light is shown on. 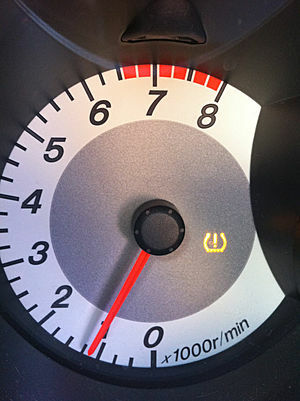 It's the first cold fall morning, and suddenly you're faced with that annoying tire pressure light coming on; why? The weather plays a big part on the pressure in your tires. Hot weather may make your tires overinflate. However, very cold weather may cause your tires to be dangerously underinflated. Many newer cars have a tire pressure monitor built in for each wheel that constantly measures the inflation of that tire. A deviation from the recommended inflation pressure of your tires will cause the Tire Pressure Monitoring System (TPMS) on your car to be activated. Most TPMS measure your tires when they become significantly underinflated, and not overinflated. Your owner's manual will indicate your recommended cold tire inflation PSI. So how does the weather affect your tires? Most tires are inflated with air, although some dealers are now using nitrogen because the nitrogen molecules are larger than oxygen molecules. Seepage is thus reduced through the tire walls and where the tire meets the rim. Any moisture in the tire is also eliminated, which can affect inflation. There is a basic relationship between the change in temperature and pressure. When the temperature outside the tire changes, it will affect the pressure inside the tire. In the fall, the colder weather will significantly lower your tire pressure. If your tire pressure has been set during the hot summer months, the first major cold wave will cause the air to contract inside your tire, lowering the pressure, thus setting off your TPMS. The TPMS alarm is more prone to go off if one of your tires is already slightly underinflated. In addition, cars that sit outside all night will be affected more by the colder weather than those kept in a garage. To alleviate that annoying tire light, check your tire pressure monthly, during the morning, when tires are cold. During this time, make sure all tires are at the PSI indicated in your manual. As you drive your car, friction causes the tires to heat up, increasing the pressure within the tire. Checking the tire pressure after you have been driving around may give inaccurate, misleadingly high pressure readings.